Home › Frugal Living › Kitchen Hacks that Save You Money Now! My family and I spend a lot of time in the kitchen. We also try to save money every chance we get! That’s why we brainstormed and came up with kitchen hacks that save you money — right now! My kids almost always accompany to the grocery store. If you happened to see us out and about, you just may catch my kids comparing prices, ounces and quality to make sure it’s the best bang for our buck. That’s just one reason why we grab Hefty trash bags — because it’s an awesome quality trash bag, but with a new lower price! Now, how many times do you find a brand that actually lowers its price — without a sale? So let’s dig into these money-saving kitchen hacks that will help you easily save money — in the kitchen! Invest in the best. 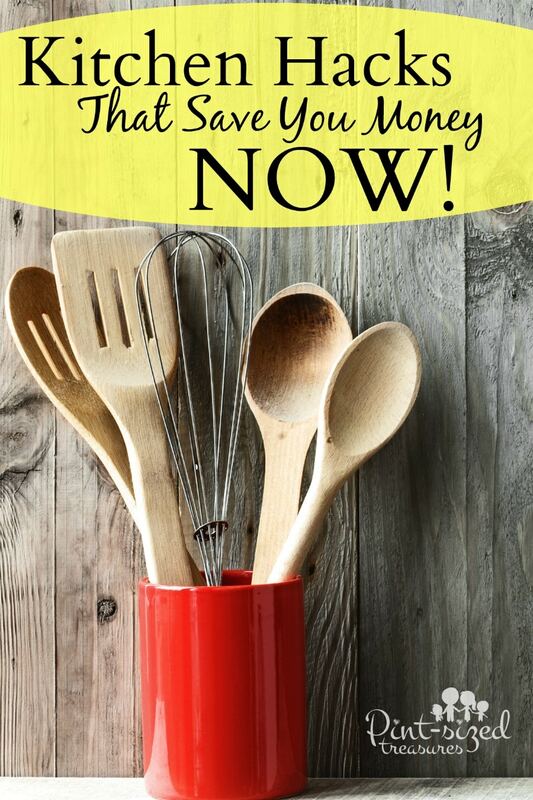 When it comes to kitchen supplies, make sure you only grab the best. Who wants to load up the kitchen trash can and then have the bag burst open on the way to the garbage outside? Double ewwww! Grabbing super-strong Hefty trash bags will save you money — because you don’t have to re-bag a busted one — and save you stress. 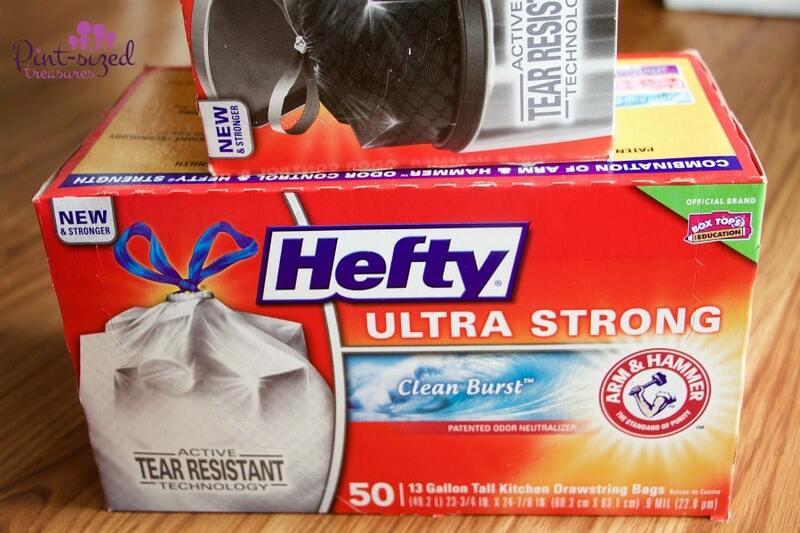 Hefty has an active tear resistant technology for better puncture resistance — not to mention there are some great-smelling options now! An added fresh scent to help your kitchen stay smelling clean — even when there’s something stinky lurking in your garbage pail. Keep food containers and packages securely closed. It’s pretty simple. grab some cute clips and keep your chips, snacks or other items folded and clipped. This way food doesn’t grow stale. You don’t have to toss an opened box of snacks because they grew stale or yucky lucking. Keeping them clipped securely helps prevent that from happening! Keep perishables near the front of your fridge. How many times have you opened the fruit drawer and found rotten veggies or fruit? I’m convinced that drawer was made by food producers so they could double their profit — wink, wink! Be a rebel and pull out the fruit and veggies and place them right where you can see them. Why? So you can be reminded that those quick-to-spoil foods need to be eaten in the near future. 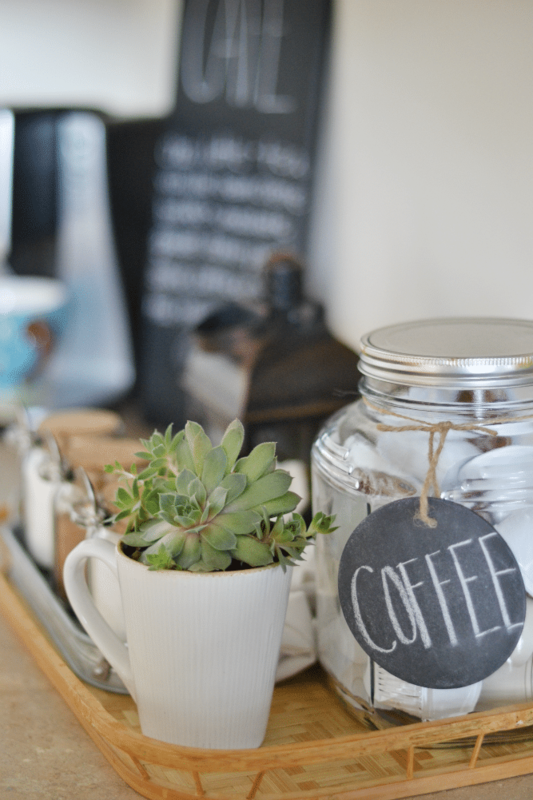 Set-up a cute coffee station. My weakness is coffee. There, I said it. But the temptation to run out to an expensive coffee shop is much less when there’s a crazy cute coffee station stocked with amazing coffee, fun creamers and sweeteners. Making this change could easily save you $15 per week! Keep your pantry organized. No, you don’t have to go overboard and organize it alphabetically or even by color, but just keep sauces with sauces, beans with beans, sugar with sugar etc. This way you can keep running list in your mind of what you do and don’t have. It also prevents you from purchasing items that you already have on the shelf! How many times have you gone out for your weekly grocery trip and come back with a large jar of peanut butter — only to spy one peeking at you in the pantry? Solution? Keep pantry items organized and easy-to-see! Make your own cleaning products! Now THIS is fun! grab the kids and they can learn a hands-one science lesson! Grab some super-easy homemade cleaning solutions recipes right here. You’ll house will be smelling great and sparkling clean for a fraction of the price you spend on conventional cleaners! Use colored cups for your family.Give each family member his or her own colored cup. Sara can have purple, Ethan can have green etc. This way everyone knows which cup is his or hers and they can use one cup for the entire day! This saves money on water, dishwashing liquid and time! Make your own cleaning pads. If you have one of the mops or sweepers with changeable cleaning pads, you can save a good bit of money by purchasing re-usable pads or machineg your own. These are washable and you can just toss and wash! It’s simple, effective and will give you lots of wiggle room in your budget! What are some ways your family saves money in the kitchen? Chat with us about it on Facebook! And one more money-saving kitchen hack? If you purchase two or more Hefty trash bags at Target, you’ll earn a $10 Target gift card!